Earlier I addressed the subject of things you can and can’t compost from within your home. But now allow me to isolate and elaborate on my favorite part of the indoor composting process. Inside my house, the shredder is the equivalent to the compost bin outdoors, based on how much it is put to work. I shred everything! In fact, I derive great pleasure from it. If you think that sounds a little odd, just know that my kids argue over who gets to shred the next stack. The point is so much that makes its way into our homes is fair game for the shredder. As long as there is junk mail, schoolwork, bills or anything else printed, there will always be and endless source of compostable material from inside the house. And while we’re having some good clean family fun reducing unwanted paper to confetti, I am creating a wonderful carbon-rich addition for the compost pile and ultimately the best soil amendment in the world! With the help of a good shredder, you can make great composting ingredients quickly and easily and finally put those papers in their proper place! Shredders are readily available today from many sources; drug stores, office supply stores and the big warehouse clubs all sell them. I use a high quality, home office version that I purchased for about $150. It can take about 15 sheets at a time, cuts paper into confetti and handles a large volume, all without removing a single staple or paperclip. It can even cut through CDs, DVDs and credit cards. However, knowing that everything I shred is destined for the compost pile, I don’t include these. As with most things in life, you get what you pay for, and so it is with shredders too. I’ve had the small and inexpensive trash can size in the past but to me, they’re more trouble than they’re worth. The small cans fill up too quickly for all the trash I have. 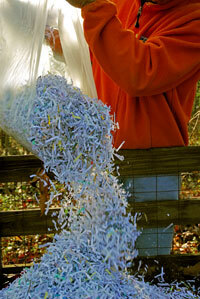 On my current model, I even enjoy hauling out the container of confetti paper to dump into the compost pile. It’s quite attractive actually. In short order, all the different colors from the confetti are soon reduced to the same unrecognizable common denominator of finished compost. Even if someday we do actually become a ‘paperless’ society, I can’t imagine junk mail ever going away. And as long as there is junk mail, there will an endless source of compostable material from inside the house…meaning there will always be an endless source! Besides the true pleasure I get in reducing these offensive mailings to confetti, I must say, I am amazed at how quickly that volume of paper adds up, not to mention that for much of my life, I was contributing so much unnecessary waste to the landfill. Now, with the affordability of quality shredders for the home, I encourage you to get one and start using it right away, especially since there’s not much else going on the compost pile this time of year. Although the extra compost you’ll make is the direct benefit, keeping all that paper out of the landfill is a simple and significant way to do something good for our planet too. I will be worried of the ink in the papers. Most inks are very toxic. Luis, many inks are soy based which is not toxic. To be on the safe side, avoid using colored or glossy coated papers for your compost. A great way to recycle too! I compost piles of shredded paper from my office. I shred leaves, grass clippings, sawdust, office paper, hay from my square bale garden and urine. The difference office paper makes in the mix is astounding! People have asked to buy my compost due to the quality that only shredded paper provides. To the naysayers, I suggest you try it before you deny it. I have found that a 60 Gal trashbag of shreds makes about 5 gals of finished compost. It sounds like you have a great system that works. Not only are you reducing what goes to the landfill you are turning what can be a problem into an asset! Keep up the good work. Happy Holidays! A no to shreaded paper in my compost. It can be plane cardboard without printing marks/letters, but nothing elese if you care about your life. there are many questions and comments about adding junk mail to compost. i really didnt want to keep repeating it again, but for clarification purposes, can someone answer if i can add all those weekly ad papers from grocery stores and sale ad flyers from big box stores to the compost after shredding them. i dont mean the glossy ones, but matte ones with colored print all over. Regarding inks and bills. I work in an office service facility that focuses on print and mail. Our older printers printed on paper that was run through a 5 color press for color. These inks had to be thinned for use and the paper had to cure for 2 or more days. Not sure what the inks were made of on that press since it has been phased out. This paper stock was then ran through a printer to print various bills, statements and letters using a xerographic process. The toner is made of plastic powder that is pressed and heated to fuse it to the paper. I would guess that most laser printed papers have a plastic based print. Our current print method uses very high capacity ink jet printers with 55gal drums of liquid ink. Not sure of its base but water is used for cleanup although it theoretically floats the ink to make cleaning easier. I have 8 chickens so you can imagine that I have a lot of chicken poop. I have a mostly xerascaped yard so I am lacking for carbon to mix in the compost pile. The paper scraps and straw from the egg boxes and coop floor is the only carbon I have in my compost usually and I never have a problem with it hardening or not breaking down. Can you just put shredded printer paper in your flower beds or does it have to be mixed in? You can but I’d mix it in so it breaks down faster and looks a little better. Personally, I’d mix it into a compost pile first and let it break down there for a few weeks. It will happen fast that way and do more to help your garden when you add it there. I did not see a response to gmo issue that was raised about the soy ink.This seems to me to perhaps be a major concern. Hi John. Since over 90% of US grown soy products are GMO, if one is so concerned about anything GMO making its way into the compost stream, then by all means, for the purists out there, I suppose paper using soy inks should be be left out of the compost bin as well. But considering that the vast amount of food out there that people are unknowingly putting into their body already includes GMO’s, the concern of soy ink on paper after composting being a concern is far down the line for me at this point to be concerned about. The path from the GMO crop to soy ink to compost and back to your fork is much longer than a GMO food product being directly consumed. I have a hard enough time with that at this point. Until we get mandatory GMO labeling, I’ll do the best I can with the food choices I make and avoid direct consumption of GMO food products as much as possible. While I am an organic gardener, I’m sure I don’t catch everything going into my garden that the USDA would ding me for to be considered “certified organic”. I’m also not a fan of GMO food crops. But as for me, I’m just not yet feeling compelled to ban paper that may contain soy ink from going into my compost bin. My two cents. I have used shredded newspaper in my vegetable gardens for years. An old time farmer told me to do this, and it’s good for the soil, keeps weeds out and holds in moisture. I also put leaves in the fall and rotor till it in the soil. Good to see people are talking about this issue of recycling ! BUT, let me tell you about this shredded paper idea. Two years ago I saved all my shredded bills and white paper shredded only. when my raised beds were built, I decided it would be a dandy idea to put scrap paper, newspaper, cereal boxes and such in the BOTTOM of the bed along with the shredded paper. My thought being that the coverage would keep out the unwanted roots and add to thee water retention of the raised beds. Well, the paper, and such turned to something like concrete ! Lets call it PAPER MASH’E ! That has caused some real problems such as mold and mildew. Now I cannot till the soil for fear it will contaminate the entire bed AND the roots have grown through anyway ! Please re assure me that if I add the shredded white paper to my compost it will NOT turn to concrete like material later ! It won’t Patricia and here’s why. In an active composting environment, the ingredients have access to air and moisture, carbon and nitrogen, as well as billions of micro-organisms actively consuming and breaking down the waste. All of that is needed for compost to happen. In relatively short oder, the paper, and other natural ingredients become such that you cannot recognize it from its original life. However, in the bottom of a raised bed, there is little to no oxygen. It’s a critical part of the decomposition process. The problem is exacerbated by an excess or absence of moisture. The condition results in an anaerobic state, which is the reason you are getting paper mash’e. The same thing happens in landfills. Paper just doesn’t break down in the absence of air and water. The proof is when modern landfills are excavated and newspapers are recovered where the date can still be read…from the 1940’s! You will will be fine to put the shredded paper in the compost pile. just continue to mix it in with the rest of the ingredients, add water periodically to keep it moist, add green waste as you can, and you will have success. Finally, I don’t include window envelopes into my shredder to take to compost. Those waxy windows take forever to breakdown, even in compost! Good luck. Good reply! I wish more people were aware of what is going on in our landfills! I hope you don’t mind if I copy and post your info to my Facebook page with info on composting! Hi Marsha. Thanks and no problem sharing my comments. Cheers. I, too, had the experience of newspaper turning to a papier mache, concrete like mess in little pieces. I think it’s because of the soy ink as I never had this happen when using newspaper in the past. I’ve spent quite a few years now picking this stuff out of my soil and I think I’ve almost got it all. Newspaper is easier to use, but I stick with cardboard now. Hi Joy. I’ve never had this problem. I think the key to making sure it doesn’t clump together is to make sure you shred it, or tear it into strips. Then mix it into the rest of your compost, so it’s blended with the rest of your composting ingredients. Then keep the pile moist and turn it / mix it about once a week. Honestly, within about 2 weeks, the newspaper has become unrecognizable as it has thoroughly broken down. Having said that, I leave the glossy color paper or advertising circulars out. I stick with just the black and white sections. Great way to use something that too many throw away. I wish you had given more information on how to use it once it’s shredded for us beginners. I read many of the comments and see that using it with my kitchen scraps will be a good balance. So, I think I’ll use 1/3 kitchen scraps, 1/3 shredded papers, and 1/3 yard waste. I think that the advice of using only newsprint type papers for food growing areas is great. Hey Joe, Thanks for this thought-provoking post. I’d like to address the comments made about the chemicals present in the inks used in mail and magazines. I think caution is a good idea only if the compost used will be used in the soil to grow food plants. Plants are incredible at breaking down chemical compounds for use in their biological processes, and are actually used to purify soil that has been contaminated with chemicals that are harmful to people and animals. But I think people should be aware that, once those plants remediate a polluted environment, the plants are not eaten. So continue on with this if you’re only using this to nourish ornamentals. Hi Anna. Always good to err on the side of caution. As a rule, I keep all colored ads and glossy circulars out of my shredder for composting. It gets recycled instead. Thanks for your comments here and your points are spot on. Just a thought…just use the white paper…the colored stuff uses dyes that are toxic. I’ve had a $150. shredder for around 5-6 years because of a handy little tip I found on the internet. Use 3-in-one oil on the blades every so often, or whenever you think of it!! Just like you would with anything that has blades. It lengthens the life and you’ll have that shredder for a lot longer. Good tip Deb. I put my shredder through the ringer over Thanksgiving and I am sure it could have used a few drops of oil. I’ll be sure to do that now. Thanks for sharing the good advice. Hi. We’ve got bags of shredded paper we’re keen to use on the garden. I’ve been told it’s best to wet/soak it first … do you recommend that for putting it on the compost pile too? Hi Rachel. Soaking the paper first will help it breakdown more quickly, so yes, this is a good idea. Other people use whole sheets of newspaper to line walkways to help prevent weeds from germinating. Not that you’re asking about that, but if you ever try this, wet that paper also before laying down as it will help it from blowing away. I know this is an old post, but if you could help me out I would appreciate it. I live in an apartment and do not have a plot of ground. I do, however, have a ton of plants and do buy potting soil. I also have a high grade shredder thanks to me IT husband. Could this work for me in an apt setting? If so, how would I go about using the paper shreds? Do I wet it and mix it with my potting soil? Sorry, I’m not sure how to use this , but have had a desire to figure out how to use my paper shreds. Hi Kim. Yes, go ahead and add your paper shreds to your other ingredients like food scraps. The paper would be a nice carbon balance to the nitrogen being added from the veggies, etc. I think it makes sense in your case to pre-soak the shredded paper so they go into the pile that way. Just sounds less messy and it will ensure the paper is moistened. That’s important for it to break down quicker. But you need to keep it moist and turn the entire collection once a week or so if you can. You can also mix in or all all this to your base collection of potting soil. You’re basically making a big batch of collected ingredients from the soil you get, food scraps, shredded paper, leaf debris, etc. I so agree with the previous post!!!! This is completely the wrong thing to do. I am an organic gardener which means NO Chemicals that are not natural and safe for the environment. I cannot believe people are so irresponsible with our children’s futures. We need to let the earth renew itself from all our vile attacks on it. Don’t use junk mail like this. Please!! How you can recommend this without doing a cursory check is beyond me. Shudder. You might want sort the junk mail into bio friendly ( non-pigmented, newspapers, cardboard, corrugated etc.) and questionable (highly pigmented, window envelopes, laser printed paper etc). Use the bio friendly for mulch and compost and the questionable as kindling in your wood stove – it burns much better when shredded. If you don’t have a wood stove then don’t bother shredding and get it to the recycle center. I use shredded bills & tp/paper towel rolls as bedding in my chicken coop. When I clean out the coop, it all goes into the compost pile & the paper breaks down much faster with the ‘hot’ chicken manure. What a great idea. Thank you so much. Will start today. I go one step further and use the shredded paper as mulch. The white reflects the sun, keeping the plants cooler. In the NJ sun. And reflecting the sun to the plants not the soil. And it keeps it moist as well. Eventually it becomes a hard mass that allows no weed thru. It’s a win win. After seeing your post, I’m going to shred all our old bills that have pilled up in boxes. My husband wanted to burn them in our fire pit, but it takes too long and I worry about the embers flying away and starting unwanted fires, plus I need the paper. But I’ve been wondering about cereal boxes or cracker boxes. I’ve ripped up one box and put it in my compost and started working on another one, but I wonder about the ink on the boxes. Is it like the glossy papers you mention on Joe’s question and your relies. Also I read where you said hair is good and I cleaned my hair brush and threw that in. So I put my vacum bag in there because of all the dirt from our yard is tracked in the house from our dog and shoes & a of course dog hair. The only concern is the colored bag, its an Orick bag. OK folks. I don’t know for sure here. I’m thinking it would be like magazines. Can anyone help out here? Good question. I called some of the companies about the cereal boxes, etc. The people I talked to had no idea what kind of ink, glue, etc was used, so I stopped using them for anything garden related to be on the safe side. Like I stated in my earlier post, the soy based inks used in newspapers are generally considered safe, but if you are concerned about GMO’s, I would not use them because nearly all soy is genetically modified, so you are bringing that material into your garden and therefore, your food. Also lasar printer “ink” is plastic based, not really ink at all. Take a letter from your junk mail and stick a hot iron on top of the “ink”. Melts right off onto the iron…plastic. Do you really want petrolium based plastic in your soil to add BPA to the food you are hoping will be healthy for your family. Just be aware of these hidden dangers. Just because you don’t know it’s in there, doesn’t make it safe. if they cant tell you about ink and glue so you fear composting the stuff, why are you eating cereal, etc that has been packed and stored in it? I too have used shredded junk mail in my compost pile in the past, but no more. A large percentage of computer generated print is now from laser printers which are not really ink at all, but plastic. Plastic in your compost equals BPA. Also, the soy based inks from ink jet printers and on newspapers are mostly made from genetically modified soybeans, so that means you are puting GMOs into the compost you feed your plants. Not a big deal for some, but as an organic gardener, it is significant to me. It seems we are constantly finding bad things “hidden” in our environment and the more you pay attention, the more you will be astonished at the things we are exposed to on a 24/7 basis. I love this idea but may I suggest that you keep the prepaid return envelopes out and send them back empty from the credit companies they came from. The company does not pay for these envelopes unless they are returned. Doing this keeps our post office in the black and has the CCC paying for at least one service our goverment provided. I also have to add I do not condon puting anything in these envelopes not shreding or flour or anything thing else you may feel is sticking it to the man. The billionar making money from credit cards will never see it and you will only make the little guys life harder. We all need to work and that means some of us work in the mail room at such companies, so be kind and just send back empty envelopes. Other then that I can’t wait to get my compost started so I can add one more thing to it. If we don’t have a pile do you think it would be ok to add it to a yard waist bucket? I add my veggie trimings and other compostable things to that bucket why not that? I hate those solicitation letters as well! What a waste of resources. My method of attacking this problem is to have myself removed from the list that is used by most companies to send this uninvited information. You can register yourself by searching online for “Stop Junk Mail”. There is a service you can add your contact info to that notifies the credit bureaus to remove your information. It lasts for 5 years. I’ve found it cuts down on this kind of mail tremendously and conserves precious resources, more importantly! As for your waste bucket, you can add the paper to that, but you need a certain size that’s big enough for everything to work best for decomposition. Ideally that should be a pile at least 3′ x 3′ x 3′. So ultimately, you should find a place to dump your bucket onto something bigger. When I receive unsolicited mail that has a prepaid envelope in it, I put the information they sent back into it an mail it back to them. Helps my postal carrier keep working plus others, I would imagine. I also worry about the inks, bleaches and other chemicals in whitened, coloured or coated paper. Are these things safe? I am also concerned about the chemicals involved with junk mail, etc. and anything printed. We try to keep chemicals out of our garden, and certainly out of the composting. I hope you will comment on this…thanks! All my research and sources say that the inks and dyes used today are safe since they are vegetable based (usually soy). This differs from 30 years ago or so when inks contained metals that you would not want to add to your compost. I meant to clarify one additional point. There is still question as to the safety of glossy paper and magazine pages. The glossiness is often due to a clay coating but there is still a chance the processes that make the paper as such includes metals such as zinc and copper. My advice (and what I do myself) is to recycle my magazines and glossy circulars and only compost non-glossy paper. Hi Michele. The environmental concerns of what goes into making and coloring paper has been good for those of us who use paper as an ingredient in making compost. Today’s inks are vegetable based so they’re ok for the compost pile. Just wanted to make sure you noticed my additional comment to this post regarding the use and risk of glossy or magazine paper. I don’t add that to my compost since there is still the possibility of metals such as zinc and copper used to make the paper this way. Although the levels may be low, I prefer to simply recycle them rather than add to my compost. I know about (and do) compost paper along with all my grass clippings, limbs, leaves, food, whatever, but I’ve always read that glossy paper shouldn’t be composted. Your article doesn’t differentiate between glossy and non-glossy paper. Am I correct in assuming that it is quite acceptable to compost glossy paper as well? Hey Ray. My understanding is that glossy paper and magazines “may” still contain metals. Zinc and copper and specifically listed in the research I’ve seen (although levels may be very low). Although a clay coating appears to be the most common method for creating the glossy look, without knowing for sure, I prefer to simply send my magazines and glossy circulars to the recycling center instead. We have a spring branch cleanup everyyear in our neighbor and before I give some away I was wondering if chopped up branches would be good to have in the soil mixture. Wow, I never of thought of junk mail like that, I mostly stuck with the chemical fertilizers and the stinky fertilizers. Now I have a cleaner and safer way to fertilize my plants. Goodbye stacks of paper in my house! Thanks so much for sharing, this has been such great help.